Anti-apartheid stalwart Winnie Madikizela-Mandela has died at the age of 81, her family confirmed in a statement yesterday. “It is with profound sadness that we inform the public that Ms Winnie Madikizela-Mandela passed away at the Netcare Milpark Hospital, Johannesburg, South Africa, on Monday the 2nd of April 2018,” the statement said. The family said Madikizela-Mandela died after a long illness, for which she had been in and out of hospital since the start of the year. She succumbed peacefully in the early hours of Monday afternoon surrounded by her family and loved ones. Madikizela-Mandela was one of the greatest icons of the struggle against the evil apartheid system, which saw her former husband, the late President Nelson Mandela, being incarcerated at Robben Island for 27 years. She fought valiantly against the apartheid state and sacrificed her life for the freedom of the country. Her activism and resistance to apartheid landed her in jail on numerous occasions, eventually causing her banishment to the small town of Brandfort in the then Orange Free State. Madikizela-Mandela kept the memory of her imprisoned husband alive during his years on Robben Island and helped give the struggle for justice in South Africa one its most recognisable faces. She dedicated most of her adult life to the people’s cause and for this, she was known far and wide as the Mother of the Nation. 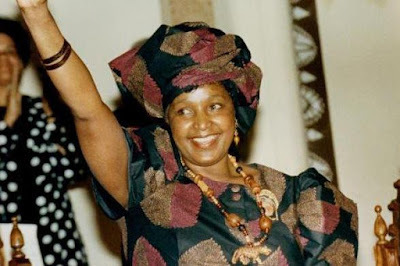 Addressing South Africans in a televised statement, President Cyril Ramaphosa said “Mama Winnie” was an abiding symbol of the desire of our people to be free. “Mama Winnie was a voice of defiance and resistance. In the face of exploitation, she was a champion of justice and equality. Throughout her life, she made an everlasting contribution to the struggle through sacrifice and her unyielding determination,” he said. He said Madikizela-Mandela was a voice for the voiceless urging South Africa to draw inspiration from the struggles that she fought for and the dream of a better society to which she dedicated her entire life. “Today we have lost a mother, a grandmother, a friend, a comrade, a leader, and an icon. As South Africans, we collectively pass our condolences to the Madikizela and the Mandela families. Your loss is our loss as well. May her Soul Rest in Peace,” President Ramaphosa said. He was expected to visit Madikizela-Mandela’s homestead in Soweto, to pay his condolences to her family and hundreds of mourners from across the political and social divide. South Africa’s Presiding Officers of Parliament, National Assembly Speaker Baleka Mbete and National Council of Provinces Chairperson Thandi Modise, expressed shock and collective grief at the passing-on of the veteran Member of Parliament and struggle icon in a statement. “Speaker Mbete and chairperson Modise said as a struggle icon in her own right during years of colonial and apartheid repression, Ms Madikizela-Mandela carved her niche role in shaping the struggle for freedom and in efforts to realize the new free and democratic South Africa,” reads the statement. They said as one of the pioneer Members of Parliament, “Ma-Winnie”, as she was affectionately known, paved the way for what the Parliament of South Africa has since become. Speaker Mbete and chairperson Modise said the challenges of poverty, inequality from a gender and race perspective, under development and many societal ills facing South Africa today, are problems she fought tirelessly to eradicate, as a contribution to building a truly socially just country where all people can enjoy a great quality of life. In a statement, anti-apartheid icon and Nobel Laureate Archbishop Desmond Tutu and his wife, Leah paid their respects to Madikizela-Mandela describing her as the defining symbol of the struggle against apartheid. “She refused to be bowed by the imprisonment of her husband‚ the perpetual harassment of her family by security forces‚ detentions‚ bannings and banishment. Her courageous defiance was deeply inspirational to me‚ and to generations of activists. Leah and I send our heartfelt condolences to her daughters‚ grandchildren and extended family. May she rest in peace and rise in glory‚” read the statement. Leader of the Economic Freedom Fighters Julius Malema on his Twitter account uploaded a black screen with emojis of a broken heart and tears. She was born on September 26, 1936 as Nomzamo Winifred Zanyiwe Madikizela in the Eastern Cape Province. In 1955, Madikizela-Mandela became South Africa’s first black social worker at a hospital in Soweto. She married Nelson Mandela, a lawyer and leading member of the anti-apartheid African National Congress (ANC) and they had two daughters. They divorced in 1996, but she remained a strong ANC cadre until her death yesterday. Madikizela-Mandela’s family said they would release details of the memorial and funeral services once they have been finished aftter consultations.